Nowadays around 150 of these languages are still spoken, with only 15-18 still being learned as first languages by children, and many new varieties have since emerged through contact with English, such as a variety of creoles (e.g. Kriol) and Aboriginal Englishes. Around 3% of Australia’s current population are Indigenous (some 670,000 people). About a quarter of this group lives in remote areas near to the traditional territories they have inherited from their ancestors. Do you know which language is or was spoken in the area where you live? 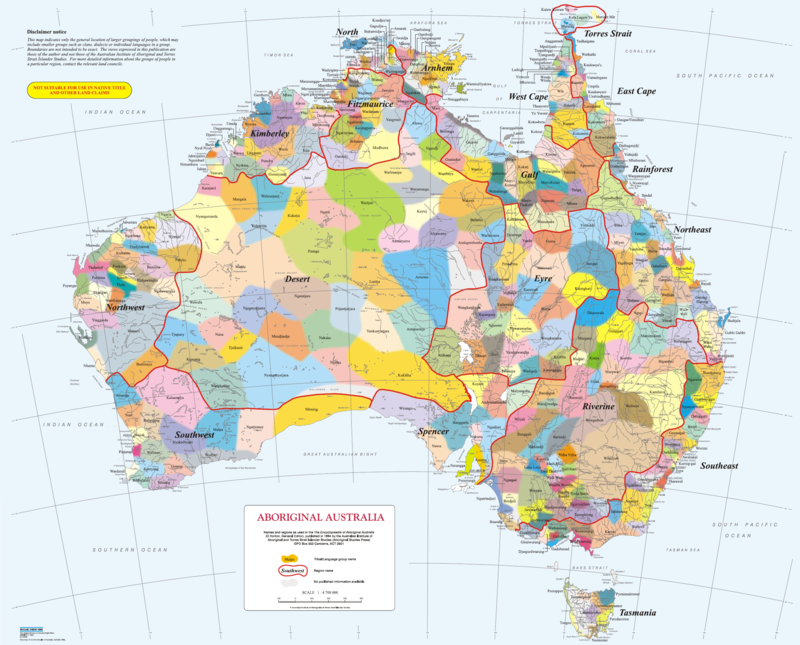 Click here to explore the Australian languages map! Or if you prefer, here’s a baked version from Linguistics Roadie Katie! Diversity and language familes: The languages of Indigenous Australia belong to a number of language ‘families’: groups of languages that are historically related and share certain features. One large family, which linguists refer to as ‘Pama-Nyungan’, encompasses the languages spoken across most of Australia (in yellow in the map below). This large language family might be comparable in age and diversity to something like Indo-European, which we discuss here. The languages spoken in the rest of Australia (in northern WA and the NT) belong to perhaps as many as 24 other distinct language families, which are known collectively as ‘Non-Pama-Nyungan’. You can see some of these in the other colours on the map above. Linguists continue to research and debate how the languages of Australia are related to each other – it’s a very difficult task that involves lots of careful and painstaking work! A multilingual region: When the First Fleet arrived, Australia was an intensely multilingual place (and of course it still is in many ways!). Indigenous speakers/signers typically had mastery of several languages, and used different ones in different contexts and places. There were lots of reasons for this. One important reason is that language in Aboriginal Australia is very strongly connected to land and territory: people and languages (as well as cultural, artistic and ceremonial practices) are understood to belong to particular terrain. This means that individuals ‘own’ certain languages, and there are rights and responsibilities about using them. They may also speak or sign several other languages but may not ‘own’ them in the same way. Prior to white contact, there was no one language that was used across Australia that everyone could understand. Language speaker/signer communities were often quite small, although that didn’t mean that they were endangered; people used language in such a way that many different languages were able to be maintained. People also sometimes mixed their languages together in structured ways, switching from one language to another even within a single sentence (known as ‘code-switching’ or ‘code-mixing’). Language is passed down within families, and so you might learn several languages from your parents and grandparents in childhood. You may then learn other languages spoken/signed around you in the broader community, and you might even gain a new language if you marry someone from another language group. If you travel around and interact with people further afield, as many people did and do, you’d need to learn even more! As you can see, it’s quite easy and normal to end up speaking/signing many different languages! While things have certainly changed in the last couple of centuries, many Aboriginal people are still very multilingual. In some regions, such as in Arnhem Land in the Northern Territory (see map to the right), people speak several Indigenous languages as well as a variety of English and/or Kriol. It’s also the case, however, that many languages have been lost since the late 18th century, and that patterns in the way people used different languages has been widely disrupted. In fact, some linguists have reported that Australia is the country that has experienced the most rapid loss of languages over last century. Nevertheless, many Indigenous people are fighting to keep their languages strong and are also using newer languages like Kriol to express their cultural identities. Story resource: Explore the Living Archive of Australian Languages. There are written and spoken stories from all around the Northern Territory. Australian Indigenous words you may know!